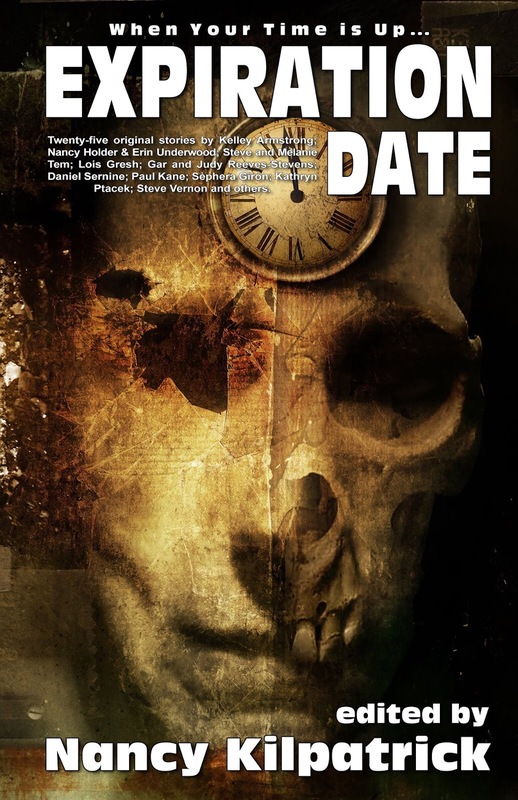 A review of “Expiration Date” Edited by Nancy Kilpatrick (Edge, 2015). Nancy Kilpatrick’s “Expiration Date” is a collection of stories that investigate one of our closest companions, an ever-present voyager on our path through life: Death. From Vampires to Banshee to the Grim Reaper him/herself, “Expiration Date” is an exploration of that inevitable force that shapes mortal life. The tales in this collection draw on folklore and modern speculations about death to create a complex tapestry of jagged life-threads, strings of tales cut off by the Morae (the Fates) and strung together into a death shroud of imagination and speculation. These aren’t just morbid tales about the ends of lives, but speculations about this inevitable force that all of us have to eventually face. These are thought-provoking imaginings about issues of mortality, immortality, the fear of the unknown, grief, and fate. These tales explore the power of loss when someone dies, but they also explore the loss that immortality entails, the accumulation of losses over the course of years that make up the lives of the eternal. “Expiration Date” is an interview with Death, an interrogation of those mysteries, and, like Death itself, these stories open up more questions than they answer. This is speculative fiction at its most powerful, speculating the greatest mystery and the final frontier. Having a gift for artistic expression is a challenging thing. It tends to come with a heavy dose of “imposter syndrome” and the feeling that one is never doing enough or that one’s work is not good enough. When Jess sees a woman in white tie red balloons around the necks of various artists, killing them and trapping part of them in the balloon, she begins to think that her psychological disability has changed to include delusions, but the experiences are seen by other artists, propelling them to produce more work and express their artistic gift. Mary E. Choo’s “That Brightness” explores the complexity of artistic experience and the societal pressures surrounding the artist to create new works of art. This is work on the palette knife’s edge between life and death with a muse who inspires through threats to offset the incredible amounts of doubt that surround any artistic pursuit in a society that de-values art and presents the artist herself as a cultural consumable object. To discover more about Expiration Date, visit Edge’s website at http://edgewebsite.com/books/expirationdate/expirationdate-catalog.html . It is always exciting to see a collection on the notion of the “Expiration Date” open with a vampire story – a monster developed as a fundamental question to the notion of death itself and occupying a liminal status between life and death while complicating both ideas. Kelley Armstrong’s “Sorry Seems to be the Hardest Word” reintroduces some of the vampires from Kelley’s other fiction including Zoe, the Toronto vampire who people feel doesn’t really count as a vampire, and Cassandra, a vampire who has lived well beyond the date at which most vampires die. In Armstrong’s Otherworld stories, vampires are only able to live a certain number of years and each year, on their birthday, they must kill a human being and drink the last of their blood. As vampires age (still well beyond a human lifespan), they begin to experience the effects of aging and eventually die. Cassandra is seeking a replacement for herself on the supernatural council as the vampire representative and she has identified Zoe as a potential replacement. Armstrong’s vampires, like many vampires in fiction, embody the clashing of past and present – figures who blur the understanding of the past by carrying memory into the present. Cassandra embodies this clash of temporalities by being an antique dealer, working with items from the past and bringing them into the present. Zoe embodies her resistance to the timeline by being an antique thief, stealing those moments of the past as she does by living beyond her years. But, Zoe and Cassandra’s strange relationship to time is most important in the notion of what is remembered and what is forgotten or left in the past. When Zoe’s young, human protage, Brittany the (former) Vampire Slayer (yes, she is definitely an Armstronged Buffy) begins asking Cassandra about Zoe’s past, the vampire obscures the details of Zoe’s past to hide the more unsavoury details of her life, hiding the rawness of Zoe’s memories and her previous identity from Brittany. This desire to hide the past only highlights how much Zoe has changed and how much she is concerned about her changes. Yet, this is also a narrative about wanting an apology for a past wrong done to Zoe and apologies are a way of coping with the past. To further the issues of time and long life embodied by the vampire, Zoe is also facing an influx of “immortality questers” into the Toronto area – supernaturals who dissect vampires as a way to try to gain immortality. This act of questing for immortality underlines the role of the vampire as a question about immortality and survival as well as the obsession our society has with finding ways to life forever. Armstrong’s “Sorry Seems to be the Hardest Word” is about the uncertainty of time and memory and about the loss that long lives can imprint on the undead. Situated in a collection about death, this story serves as a question about death and the social power it has.